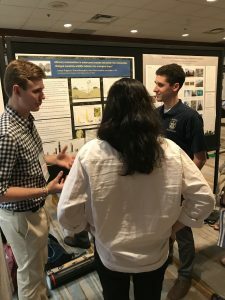 Joe Ruggiero, Shane McLaughlin, and Amber Pitt represented Trinity College at the North American Congress for Conservation Biology held 21-26 July 2018 in Toronto, Ontario, Canada. Ruggiero and McLaughlin summarized research that they implemented along with Bobbie Imwalle and Pitt, in a presentation entitled, Mercury accumulation in urban park streams and ponds: has urbanization changed would-be wildlife habitats into ecological traps?. Pitt presented some of her lab’s other recent work, in a presentation entitled: Imperiled hellbender salamander (Cryptobranchus alleganiensis) can consume invasive rusty crayfish (Faxonius [Orconectes] rusticus). Bailey D’Antonio successfully defends her honors thesis!